Ex-Demo - Product may show minor signs of use. 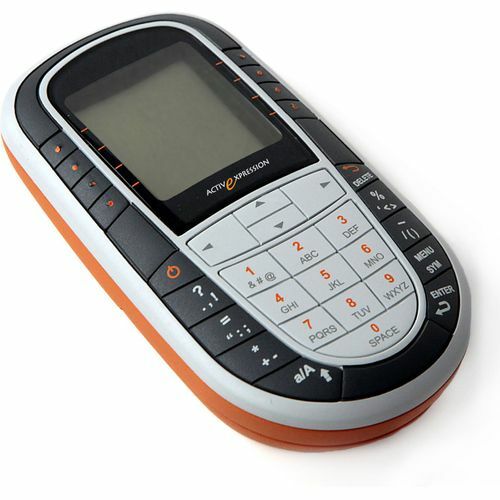 This handset can be added to Activexpression systems to increase the number of handsets.The ultimate collaborative learning tool, ActivExpression allows students to express themselves through words, numbers, symbols, Likert scales and more. Self-Paced Learning functionality encourages students to work at their own pace and level. With Self-Paced Learning, ActivExpression provides real time, immediate response details for each student per question. This facilitates immediate intervention enabling teachers to support individuals on exactly what they need, or identify individuals who need to be challenged further. With the ability to combine the progression of questions with an increase in difficulty; differentiation is achieved on a per pupil basis, enabling students to work at their own pace and level. Promethean audience response systems are compatible with any brand of interactive whiteboard and accompanying software.